1 Co-official with Greenlandic in Greenland, and Faroese in the Faroe Islands. German is recognised as a protected minority language in the South Jutland area of Denmark. Danish is recognised as a protected minority language in the Schleswig-Holstein region of Germany. The Kingdom of Denmark ( Danish: Kongeriget Danmark IPA: ['dɑnmɑɐ̥g̊]) is the smallest and southernmost of the Nordic countries. Located north of Germany (its only land neighbour), southwest of Sweden, and south of Norway, it is in Scandinavia in northern Europe, but not on the Scandinavian Peninsula. Denmark is a constitutional monarchy, the second oldest monarchy in the world and oldest in Europe. Denmark is a part of the European Union. Greenland and the Faroe Islands are crown territories of Denmark, each with political home rule. Denmark is one of the elected members of the UN Security Council and is a leader in the " Scandinavian Model" of public services. The etymology of Denmark ( Danish: Danmark) is uncertain because there are so few old sources, and the experts have two interpretations of the name. Both groups say -mark is a wild forest (uninhabited territory or lawless no-man's land). Dan-mark means: 1. An occupied hollow in a wild forest or: 2. A forest or border owned by the Danes. According to Saxo Grammaticus, Dan and Angul were the sons of the very first King of Denmark, King Humble. 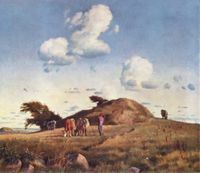 Hankehøj, by Johan Thomas Lundbye. A Danish down. Note the glacial character of the terrain and the kurgan, or burial mound of an early chief, in the centre. The earliest Danish archaeological findings date back to 130,000-110,000 BC in the Eem interglacial period. People have continually lived in Denmark since about 12,500 BC, and agriculture made inroads about 3,900 BC. The Nordic Bronze Age (1,800-600 BC) in Denmark was marked by burial mounds, which left an abundance of findings, including lurs and the Sun Chariot. During the Pre-Roman Iron Age (500 BC-AD 1), native groups began migrating south. The Roman provinces maintained trade routes and relations with native tribes in Denmark, attested by finds of Roman coins. Evidence of strong Celtic cultural influence dates from this period in Denmark and much of northwest Europe, and is among other things reflected in the finding of the Gundestrup cauldron. The first Danish people came to Denmark between the Pre-Roman and Germanic Iron Age, in the Roman Iron Age (AD 1-400). Before the arrival of precursors to the Danes, who came from Scandinavia and spoke an early form of north Germanic, most of Jutland and part of the islands had been vacated or partly vacated by the earlier Jutes, who settled in Britain together with the Angles and the Saxons to form the Anglo-Saxons. The exact origin of Denmark has been lost in history, but a short note about the Dani in " The Origin and Deeds of the Goths" from 551 AD by historian Jordanes is believed by some to be an early mention of the Daner,, one of the ethnos from which are descended the modern Danish people. The Danevirke defence structures were built in several phases from the 3rd century forth, and the sheer size of the construction efforts in 737 are contributed to the emergence of a Danish king. The new runic alphabet was first used at the same time, and Ribe, the oldest town of Denmark, was founded about 700. 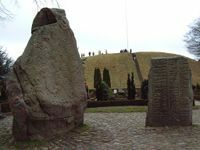 The Jelling Stones, Denmark's " birth certificate", seen from the north with " Gorm's Mound" in the background. From the 8th to the 10th century, the Danes were known as Vikings. Together with Norwegians and Swedes, they colonised, raided and traded in all parts of Europe. Viking explorers first discovered Iceland by accident in the 9th century, on the way towards the Faroe Islands and eventually came across " Vinland" (Land of wine) also known today as Newfoundland, in Canada. The Danish Vikings were most active in England and France where they temporarily conquered parts of England, known as the Danelaw, Ireland and France, giving name to the French region of Normandy. In the Viking age has there been found more Anglo-Saxon coins in Denmark than in England. As attested by the Jelling stones, the Danes were united and Christianised about 965 by Harald Bluetooth, the second recognised king of Denmark. In the early 11th century, Canute the Great won and united Denmark, England and Norway for almost 30 years. Up through the High and Late Middle Ages, the king of Denmark ruled Skåneland ( Skåne, Halland and Blekinge), Danish Estonia, as well as the duchies of Schleswig and Holstein in northern Germany. In 1397, Denmark entered the Kalmar Union with Norway and Sweden-Finland. It was a united Scandinavian state which kept the individual interests of the countries, and lasted until Sweden broke out in 1523. The Protestant Reformation came to Scandinavia in 1530s, and following the Count's Feud civil war, Denmark converted to Lutheranism in 1536. Later that year, Denmark entered a union with Norway and its colonies. Two and a half centuries of wars with Sweden followed. Skåneland was lost to Sweden in the Treaty of Roskilde in 1658 and the Denmark-Norway union was dissolved by the Treaty of Kiel in 1814, when Norway entered a new union with Sweden, which lasted until 1905. Denmark kept the colonies of Iceland, Faroe Islands and Greenland. Apart from the Nordic colonies, Denmark ruled over Danish India ( Tranquebar in India) from 1620 to 1869, the Danish Gold Coast (Ghana) from 1658 to 1850, and the Danish West Indies (the United States Virgin Islands) from 1671 to 1917. 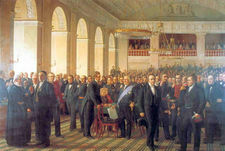 Den Grundlovsgivende Rigsforsamling (The founding fathers of the Danish constitution), 1860-1864 painting by Constantin Hansen. The Danish liberal and national movement gained momentum in the 1830s, and after the European Revolutions of 1848 Denmark became a constitutional monarchy on June 5, 1849. After the Second War of Schleswig (Danish: Slesvig) in 1864, Denmark was forced to cede Schleswig-Holstein to Prussia, in a defeat that left deep marks on the Danish national identity. After this point Denmark adopted a policy of neutrality, as a result of which Denmark stayed neutral in World War I. After the defeat of Germany, the Versailles powers offered to return the then-German region of Schleswig-Holstein to Denmark. Fearing German irredentism, Denmark refused to consider the return of the area and insisted on a plebiscite concerning the return of Schleswig. The two Schleswig Plebiscites took place on February 10 and March 14, respectively. On July 10, 1920, after the plebiscite and the King's signature July 9 on the reunion document, Northern Schleswig (Sønderjylland) was recovered by Denmark, thereby adding 163,600 inhabitants and 3,984 km². The reunion day (Genforeningsdag) is celebrated every year June 15 on Valdemarsdag. Despite its continued neutrality, Denmark was invaded by Germany ( Operation Weserübung), on April 9, 1940. Though accorded self-rule (which ended in 1943 because of a mounting resistance movement), Denmark remained militarily occupied throughout World War II. The Danish sympathy for the Allied cause was strong; 1,900 Danish police officers were arrested by the Gestapo and sent, under guard, to be interned in Buchenwald. During the war, Iceland claimed independence and in 1948 the Faroe Islands gained home rule. After the war, Denmark became one of the founding members of the United Nations and NATO and, in 1973, joined the European Economic Community (later, the European Union). In 1979, Greenland gained home rule. The Folketing in session. The speaker's podium seen from the balcony of the former members of parliament. The Kingdom of Denmark is a constitutional monarchy, with executive power with Queen Margrethe II as head of state. This executive power is exercised on behalf of the monarch by the prime minister and other cabinet ministers who head departments. The cabinet, including the prime minister, and other ministers collectively make up the government. These ministers are responsible to Parliament, the legislative body, which is traditionally considered to be supreme (that is, able to legislate on any matter and not bound by decisions of its predecessors). While the monarch is head of state and theoretically holds all executive power, it is the prime minister who is head of government. The government is answerable chiefly to Parliament; however, ministers do not have to come from Parliament, though it is the modern day custom. Folketinget is the national legislature of kingdom. It has the ultimate legislative authority according to the doctrine of parliamentary sovereignty, however questions over sovereignty have been brought forward because of Denmark’s entry into the European Union. In theory however, the doctrine prevails. Parliament consists of 179 members elected by proportional majority. Parliamentary elections are held at least every four years, but it is within the powers of the prime minister to call one sooner. On a vote of no confidence the parliament may force the entire government to resign. Compared to most other Western European countries, the Danish political system has traditionally emphasized coalitions. In some cases this has been in the form of majority coalitions, although most Danish post-war governments have been minority coalitions, ruling with more or less stable parliamentary support. Since November 2001, the Danish Prime Minister has been Anders Fogh Rasmussen from the party Venstre, a right-wing liberal party. Historically, the Social Democrats have led most post-war Danish governments, although the Social Democratic influence has never been as strong as in Sweden. Denmark's northernmost point is Skagens point (the north beach of the Skaw) at 57° 45' 7" northern latitude, the southernmost is Gedser point (the southern tip of Falster) at 54° 33' 35" northern latitude, the westernmost point is Blåvandshuk at 8° 4' 22" eastern longitude, and the easternmost point is Østerskær (Eastern Skerry) at 15° 11' 55" eastern longitude. This is in the archipelago Ertholmene 18 km northeast of Bornholm. The distance from east to west is 452 km, from north to south 360 km. Denmark consists of the peninsula of Jutland (Jylland) and 443 named islands. Of these, 76 are inhabited, with the largest being Zealand (Sjælland) and Funen (Fyn). The island of Bornholm is located somewhat east of the rest of the country, in the Baltic Sea. Many of the larger islands are connected by bridges; the Øresund Bridge connects Zealand with Sweden, the Great Belt Bridge connects Funen with Zealand, and the Little Belt Bridge connects Jutland with Funen. Ferries or small aircraft connect to the smaller islands. 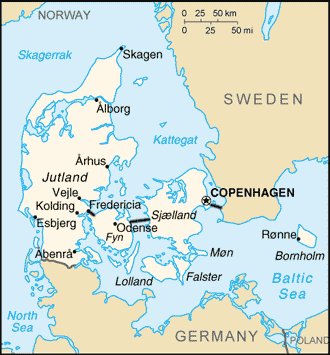 Main cities are the capital Copenhagen (on Zealand), Aarhus, Aalborg and Esbjerg (on Jutland) and Odense (on Funen). Along with Equatorial Guinea it is one of two countries in the world with its mainland on a continent and its capital city on an island. The country is mostly flat with little elevation; the highest natural point is Møllehøj, at 171 metres. Other hills in the same area southwest of Århus are Yding Skovhøj at 171 metres and Ejer Bavnehøj at 170 metres. The area of inland water is: (eastern Denmark) 210 km²; (western D.) 490 km². Denmark is split into many islands because the country's average height above sea level is only 31 metres. This results in a long coastline, more than 7,400 km. If Denmark was formed as a perfect circle, the circumference would be only 742 km. Another feature that shows the close connection between the land and ocean is that no location in Denmark is farther from the coast than 52 km. The size of the land area of Denmark cannot be stated exactly since the ocean constantly erodes and adds material to the coastline, and because of human land reclamation projects (to counter erosion). On the southwest coast of Jutland, the tide is between 1 and 2 metres, and the coastline moves outward and inward on a 10 km stretch. 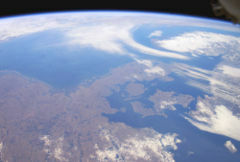 Denmark viewed from International Space Station. The climate is in the temperate zone. The winters are not particularly cold with mean temperatures of around 0.5 °C and the summers are cool with mean temperature of around 16 °C. There is a lot of wind, which is stronger during the winter and weaker during the summer. Denmark has an average of 170 rainy days. The greatest rainfall comes in September, October and November. Because of Denmark's northern location, the length of the day with sunlight varies greatly. There are short days during the winter with sunrise coming around 8 a.m. and sunset 3:30 p.m., as well as long summer days with sunrise at 3:30 a.m. and sunset at 10 p.m. The shortest and longest days of the year are celebrated. The celebration for the shortest day is Christmas (Jul) celebrated mostly on Christmas Eve, the 24th of December. Originally, this was only about the shortest day but was later combined with Christianity, although the old norse name for the celebration persisted. The celebration for the longest day is Midsummer Day, which is known as Sankthansaften in Denmark, also an old Norse tradition, later adopted by Christianity (Sankthans means Saint John). Denmark is divided into 13 counties ( amter, singular: amt), and, as of 1 January 2006, 270 municipalities ( kommuner, singular kommune). 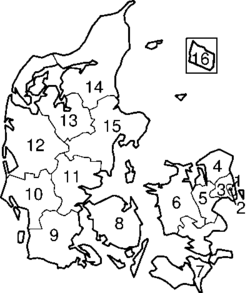 Three municipalities have county privileges—Copenhagen, Frederiksberg, and Bornholm. The coming Danish Municipal Reform will replace the counties with five new regions and reduce the number of municipalities to 98. The new municipalities will take over most of the responsibilities of the former counties. Most of the new municipalities will have a population of at least 20,000 people. This change will take effect on 1 January 2007. Copenhagen County comprises the municipalities of metropolitan Copenhagen, except Copenhagen Municipality and Frederiksberg Municipality. As of 1 January 2003 Bornholm Regional Municipality comprises the five former municipalities on the island Bornholm and the island's former county. The Ertholmene islets (population: 92(2006)), 40 hectares, 18 km northeast of Bornholm do not belong to either a municipality or a county. Greenland and the Faroe Islands are also parts of the Kingdom of Denmark, but have autonomous status and are largely self-governing, and are each represented by two seats in the parliament. This thoroughly modern market economy features high-tech agriculture, up-to-date small-scale and corporate industry, extensive government welfare measures, comfortable living standards, a stable currency, and high dependence on foreign trade. Denmark is a net exporter of food and energy and has a comfortable balance of payments surplus and zero net foreign debt. Also of importance is the sea territory of more than 105,000 km² (40,000+ sq m). Denmark's national currency, the krone (plural: kroner), is very stable and currently exchanges with American dollars at a rate of about $0.17 USD per krone (about 6 kroner per dollar). The Danish economy is highly unionised; 75% of its labor force are members of a trade union. Most trade unions take part in the organised umbrella system of trade unions, the biggest umbrella organisation being the so-called LO, the Danish Confederation of Trade Unions. However, an increasingly larger part of the labor force choose not to become members of a trade union or to become members of one of the trade unions outside the organised system (often referred to as the yellow, in Danish gule, trade unions). Relationships between unions and employers are cooperative: unions have a day-to-day role in managing the workplace, and their representatives sit on most companies' board of directors. Rules on work schedules and pay are negotiated between unions and employers, with minimal government involvement. The unemployment rate September 2006 was 4.2%, for a total of 117,100 persons. The number of unemployed is forecast at 65,000 in 2015. The number of people in the working age group, less disability pensioners etc., will grow by 10,000 to 2,860,000, and the jobs by 70,000 to 2,790,000, parttime jobs included. The government has been very successful in meeting, and even exceeding, the economic convergence criteria for participating in the third phase (a common European currency) of the Economic and Monetary Union of the European Union (EMU), but Denmark, in a September 2000 referendum, reconfirmed its decision not to join the 12 other EU members in the euro. Even so, the Danish currency remains pegged to the euro. The welfare model is the general term for Denmark to organise and finance their social security systems, health services and education. The principle behind the welfare model is that benefits should be given to all citizens who fulfill the conditions, without regard to employment or family situation. The system covers everyone; it is universal. And the benefits are given to the individual, so that e.g. married women have rights independently of their husbands. In the area of sickness and unemployment, the right to benefit is, however, always dependent on former employment and at times also on membership of a trade union and the payment of contributions; however the largest share of the financial burden is still carried by the central government (staten) and financed from general taxation, not in the main from earmarked contributions. The State is involved in financing and organising the welfare benefits available to the citizens to a far greater extent than in other European countries. For that reason the welfare model is accompanied by a taxation system which is both broadly based (25%VAT and excise) and with high income tax rates. The benefits given are more generous than is the case in the British Beveridge model — and in combination with the taxation system this brings about a greater redistribution than is the case in the Bismarck model, which is aimed rather at maintaining the present status. For the past three years Denmark has ranked first on the Economist Intelligence Unit's " e-readiness" list. "A country's "e-readiness" is a measure of its e-business environment, a collection of factors that indicate how amenable a market is to Internet-based opportunities." Enormous investment has been made in recent decades in building road and rail links between Zealand and Malmö, Sweden (the Øresund Bridge), and between Zealand and Funen (the Great Belt Fixed Link). The main railway operator is Danske Statsbaner (Danish State Railways) for passenger services and Railion for freight trains. The railway tracks are maintained by Banedanmark. Copenhagen has a small Metro system and an extensive S-tog electrified suburban railway network. Denmark's national airline (togther with Norway and Sweden) is Scandinavian Airlines System (SAS). Copenhagen Airport is the country's largest airport. A ferry link to the Faroe Islands is maintained by Smyril Line. Other international ferry services are mainly operated by DFDS (to Norway and the UK) and Scandlines (to Germany and Sweden). The majority of the population is of Scandinavian descent, with small groups of Inuit from Greenland, Faroese, and immigrants. According to official statistics in 2005, immigrants and their descendants made up 461,614 people, or 8.5% of the total population. A large number of these immigrants come from South Asia, and The Middle East. Recently, strong anti-immigrant sentiment has surfaced in Denmark as is the case also in some other parts of Europe. .
Danish is spoken throughout the country, although a small group near the German border also speaks German. Many Danes are fluent in English as well, particularly those in larger cities and the youth, who are taught foreign languages in school. Regarding religions in Denmark, according to official statistics from January 2005, 83.1% of Danes are members of the Lutheran state church, the Danish People's Church (Den Danske Folkekirke), also known as the Church of Denmark. The rest are primarily of other Christian denominations, and about 4% are Muslims. Denmark has freedom of religion, and there are numerous small religious societies and communities in addition to the official church. As in most countries, the population is not distributed evenly. Although the land area east of the Great Belt and Langelands Belt only makes up 9,622 km² (3,715 m²), 22.7% of Denmark's land area, it has 45% (2,445,168) of the population. The average population density of this area is 254 inhabitants per km² (658 per sq m). The average density in the west of the country (32,772 km²/12,653 m²) is 91/km² (236/sq m) (2006). The median age is 39.8 years with 0.98 males per female. 99% of the population is literate (age 15 and up). 1.74 children born/woman (2006 est. ), which reflects a coming drop in worker to retiree ratio. The annual average population growth is 0.33%. Population 1st October 2006 was 5,444,203, which equals 128.47 inh./km² land area or 332.75 inh./sq mi. land area (16,368 sq mi.) Censuses merely for population numbers are not conducted; they are only registerbased. A census would be prohibitively expensive and unnecessary in that the register is accurately updated. See Det Centrale Personregister. The Danish education system is sophisticated and offers free access to public school, high school and most kinds of higher education (universities etc.). About 99% of the general population attend elementary school (lasting 9 to 10 years); 86% attend secondary school and 41% pursue further education. Primary school in Denmark is "den Danske Folkeskole" or "the Danish folk school". It goes from 0-10th grade. In Denmark one can also go to "Friskole"/"Privatskole" or "free school": schools that are not under the municipalities. An example is "[Rudolf Steiner] Skolerne" or "Waldof Schools". The most special kind of school in Denmark is "Efterskole". If translated directly from Danish it becomes "afterschool". The "afterschool" goes from an 8-10 class, and everybody lives at the school. One of the big differences between a boarding school and an "afterschool" is the freedom; one has more freedom at an afterschool. Perhaps the most important Danish contribution to education is the "folkehøjskole", introduced by N.F.S. Grundtvig in the 1800s. Literally translated as "folk high school," the folkehøjskole is a social education structure without tests or grades, putting its emphasis not on demonstratable achievement but rather on communal learning, self-discovery, and learning how to think. Many young Danes attend a folkehøjskole for a few months or a year after they graduate from the Gymnasium, which is a school comparable to college in the US, before going on to university. However, the folkehøjskoles, as "schools for the people," are also resources for lifelong learning. Some folkehøjskoles have particular focus areas, such as sports, music, or environmental protection. Most, however, offer a broad liberal arts education. 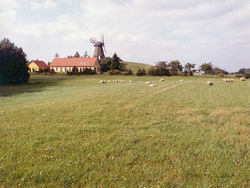 Windmills, antique (pictured) and modern, accent the gently rolling meadowlands of Denmark. Perhaps the most famous Dane is actually Hamlet, the title character of William Shakespeare's famous play, which was set in the real castle of Kronborg in Helsingør, north of Copenhagen. The play was inspired by an old Danish myth of the viking Prince Amled of Jutland, and his quest for vengeance against his father's killer. Another widely known Dane is Hans Christian Andersen, in Denmark referred to as H. C. Andersen, a writer mostly famous for such fairy tales as The Emperor's New Clothes, The Little Mermaid, and The Ugly Duckling. Also Karen Blixen (pen name: Isak Dinesen) and the Philosopher Søren Kierkegaard are well-known world wide. Also Niels Bohr, the famous physicist who developed the first working model for the atom and the quantum theory concept of complementarity. Hans Kirk, although less well-known outside of Denmark, is the author of the bestselling Danish novel of all time, The Fishermen. The most popular sport in Denmark is football (soccer). The lengthy coastline also provides good opportunity for sailing and other water sports. The "Around Zealand Regatta" is a yacht race that begins in Helsingør and continues for 2–3 days. Because of the level terrain, another common sport is cycling, and of late Copenhagen has been nicknamed the "City of Cyclists" for the frequent use of bicycles for transportation and the designated roadtracks for cyclists. Indoor sports such as badminton and handball are also popular because of the lengthy winters. The armed forces of Denmark are known as the Danish Defence Force ( Danish: Det Danske Forsvar). During peacetime, the Ministry of Defence (FM) in Denmark employs, in four branches, 15,450 in the army, 5,300 in the navy, 6,050 in the air force and more than 55,000 in the Home Guard. Although all four are under the command of the Ministry of Defence, the first three are commanded by the Defence Command (FKO) and have their own subcommand, while the Home Guard is under the direct command of the Danish Ministry of Defence in peacetime. During war, the number of active military employees balloons to more than 45,000 in the army, 7,300 in the navy a 9,500 in the air force with no change to the Home Guard, which is put under the direct command of the Defence Command. The draft age is 18 years of age for compulsory and volunteer military service. Military service is only compulsory for Danish men who are fit enough to serve. At the committee one has to pick a number from a bowl. If the number is large enough then you will not be required to serve. Otherwise one is required to serve either in the military or become a conscientious objector and undertake community service. Conscripts serve an initial training period that varies from four to 12 months according to specialisation. Reservists are assigned to mobilisation units following completion of their conscript service. Women are eligible to volunteer for military service as of 2004. There are 955,168 males and 935,643 females aged between 18 and 49 fit for military service. (2005 est).